A DXpedition doesn’t have to be expensive and complicated to be a great time. In November of 2009, Jerry Ball, N7FYP, and I did something that most other old hams would not do: We rented a contest station in another country and went on what I consider a “poor man’s DXpedition.” Neither Jerry, age 69, nor I, age 64, are serious contesters; also, like many of you, we avidly read about DXpeditions. It often seems that only the younger hams can have adventures like these. Back around Christmas of 2008, Jerry, from Washington State, and I, from Oregon, were pondering what we could do in Amateur Radio that would be exciting and new. 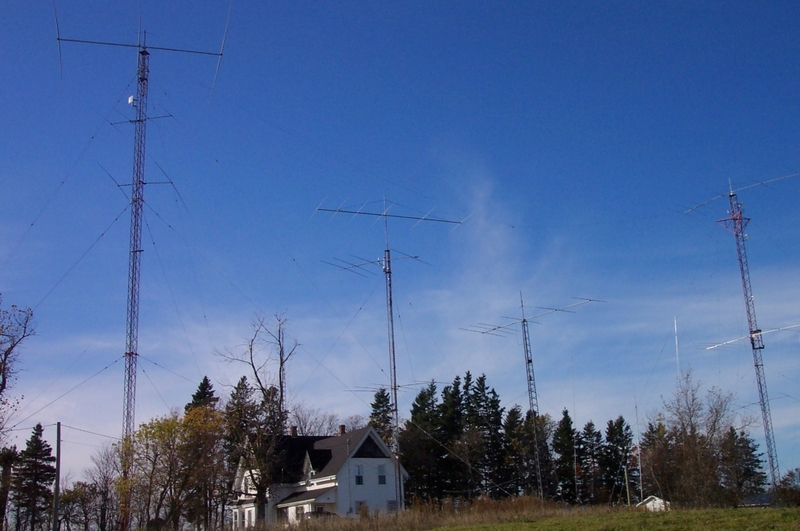 I was wandering around on the Internet a couple of days later and stumbled on Prince Edward Island DX Lodge. 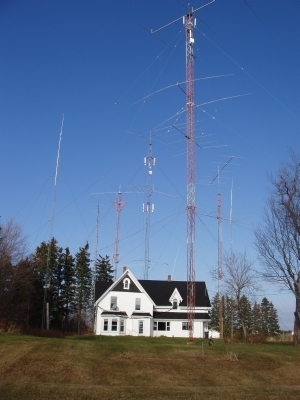 Ken Widelitz, K6LA/VY2TT, had a house, an ultramodern station and 2 acres of antennas available for rent on Prince Edward Island (PEI) in eastern Canada. Say, now this would be something: fancy equipment we will never be able to afford ourselves that is already in place and an antenna field that will reach out and touch millions. Jerry and I decided that this would be our adventure. We checked the house schedule and the first convenient time was November 16-24 2010, the ARRL Sweepstakes Contest. This was almost a year away — plenty of time for planning and anticipation. Six days in the house working the radios sounded great, but we figured that we should do some sightseeing, too. Our flight left Portland, Oregon, at 6:30 PM and got to Charlottetown, PEI, at 1 PM the following day. We allowed that afternoon to go to book stores, then to a bed and breakfast to rest. The second day was the tourist day and we spent hours at the Provincial Museum. We know that there is more to traveling than just Amateur Radio, but everything else took a definite second place. We headed out early the next day, following Highway 2. 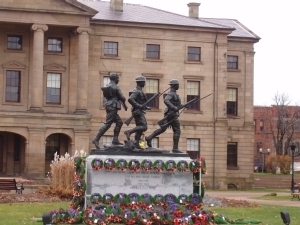 The DX Lodge was supposed to be about an hour’s drive from the town of Summerside. Jerry and I were both a little concerned as the directions said to follow Highway 2 until we saw the antennas. It is often easy to miss antennas. We had just passed St Anthony, when we topped a ridge and saw an array of antennas a few kilometers away. You couldn’t miss them. Our conversation boiled around us in the car, Are those ours? They looked too commercial to be ham antennas. They were huge! We got to the turn, took it and sure enough, there was the house and those were our antennas. We timidly drove up and parked. The first tower was 145 feet tall with a full size 40 meter M2 (48 foot, 4 inch boom), a 2 element 402BA at 95 feet fixed on South America and the southwest USA and at 81 feet a TH6DXX also fixed and aimed at South America. The second tower was 150 feet tall and set up for 20 meters (6/6/4 element Yagis at 151/87/60 feet, respectively). Tower three is 84 feet high with three 10 meter antennas (7/7/4 element Yagis at 90/60/30 feet, respectively). Tower four is a little guy at 48 feet with a 6 element M2 and a 2 meter Ringo vertical. The fifth tower is 140 feet tall, set up for 15 meters (6/6/4 element Yagis at 150/100/50 feet, respectively). The feed line for these beauties is 7/8 inch hardline. The next thing we did was go into the operating room. Beautiful equipment. Jerry and I both felt more than a little in awe. We looked around the room a bit more, saw all the rotator guides for the antennas, the four radios, the amplifiers, one whole wall filled with certificates that Ken had won from this location. We decided that we had better unload the car, find our rooms and try to bring our hearts back under control. About a half hour later, we went back into the operating room. Jerry liked the IC-7800, so he took that station; I liked the Elecraft K3, so I took that one. Following Ken’s appreciated instructions, we got the power turned on to the units and figured out how to get which antenna hooked to which radio. It was still early in the day and 20 meters was hot. I could hear England, Slovakia, Italy and Turkey. It seemed like all of Europe was thundering through. On 40 meters with the beam pointed south, we could hear many, many American hams — so very many more than we could hear at home on the West Coast. It took me a while to figure out how to use the console microphone and to “discover” the PTT foot switch. Soon our heads were capped with earphones and signals were coming in. I had to read the Alpha Power 87A amplifier manual to give me confidence to use it. The manual said to just start talking — the amplifier was microprocessor controlled and would tune itself to the right band and the right frequency. Wow, hard to believe. My old amplifier at home has to be tenderly coaxed to perform. Some of the equipment that Ken made available to us were two Elecraft K3s, an ICOM IC-7800 and IC-756 Pro III. There were two Alpha Power 87As, an Alpha Power 91B and a Dentron MLA2500. He had various antenna tuners and a fantastic custom-built antenna switch by WXØB that allowed any of 12 antennas to be selected at any of four operating positions. I will probably never have a chance to use such exotic gear again. I sat down at the operator’s table, turned on the K3 and 87A amplifier, aimed the antenna along the great circle line to Europe and Africa and called CQ. There was no answer on my first call, but on the second one a fellow in Wales answered. He gave me a strong signal report and we exchanged names and locations, and chatted a bit. After about 10 minutes we signed. Egad! There were 20 stations calling me! I was instantly giddy as I recognized calls from France, the Netherlands, Scotland, etc. I replied to one, we talked a minute, then he said that it looked like I was generating a pileup and he would turn me loose to work some more fellows. I sat there for 40 minutes, talking to one station after another. In my 45 years of hamming this was the first time I was on the “inside” of a pileup. I was done in — but more and more hams called me. Sorry fellows, I said, but I am an old man and can’t keep up a pace like this. I’ll be back later. This said, I turned the volume down on the radio, pushed the chair back and let out a loud hurrah! Now, this was real radio operating! It was outstanding what could be done with a fine antenna system and maximum legal power. The band conditions on 20 meters were such that international communication was possible from 8 AM to about 3:30 PM. Every time I got on the air for the 3 days prior to the Sweepstakes, I found myself at the heart of a pileup. What a thrill! Other bands were open to the East Coast all the time. Anytime we wanted to talk, we could. There are two basic ways to operate in a contest. One is the Search and Pounce method, where the operator tunes over a frequency range looking for another station that is calling “CQ Contest.” The other way is to be the station that sits on one frequency and calls CQ, waiting for others to respond. All of the big winners use the CQ technique. It is possible to talk to many more stations if you just sit on the one frequency and let the masses come to you. A typical station will work 60+ others in an hour. I chose the Search and Pounce system for some pretty good reasons. For one thing, not only does the CQ station have to talk to as many stations as possible, he has to maintain a log with the stations’ calls and other contest stuff that verifies that the contact was made. I can’t do this; it is too stressful for this old guy. I decided to go with search and pounce, call a station, work him, then take as long as I want to make a log entry, search out another CQ station and start again. I can average (on a good day) 20 contacts per hour. As you can see, this does not compare very favorably with the CQer’s 60 or 70. It is evident that I did not get in this contest to win, but rather to have fun. I came out of the Sweepstakes with a score of 25,000 points. The winning station will have about 6,000,000 points. Ken, VY2TT, placed second last year. This station had the capacity for being a winner with better contesters at the helm. Even search and pounce operators were expected to run two radios at a time, searching for the next station to work simultaneously with working the current station. Phooey; no can do. I read an article about how to operate with two radios. It explained how you could be tuning at the same time the other station was talking — at the same time you were typing his log information into the computer. I just can’t do it. It was one radio at a time for me. I made about 205 contacts and had fun. The contest wasn’t everything. In fact, as it turned out the peak of our excitement was in the 3 days we had to prepare for the contest, getting to know the radios and working DX stations. A trip like this is possible for older hams. We, too, can have new experiences in Amateur Radio. Photos courtesy Mike Horvat, W7ASF. Mike Horvat, W7ASF, an ARRL member, obtained his Novice license in 1958. He upgraded to General and remains one today. He was sidetracked by college and Vietnam but eventually returned to ham radio. He spent most of his ham time using wire antennas strung up on city lots until 2009 when he put up his first beam. At one time he collected vintage radios, amassing a collection of over 1500. For a time he supplied other hams with copies of tube gear manuals just for the cost of copying. Not wanting his ham life to stagnate, in 2007 Rich, N7TCO, and Mike motored to Alaska to NA-029 for the IOTA contest. In 2009, Jerry, N7FYP, and Mike made the trip you just read about and in 2010 he and Tom, KB7JAL, took another poor man’s DXpedition to Belize. 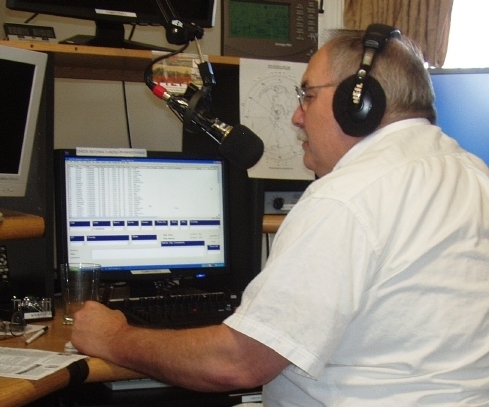 Mike can be reached at PO Box 741, Stayton, OR 97383-0741, w7asf@arrl.net.